Whale watching is an experience you are unlikely to forget in a hurry. However, it is easy to be unprepared or under-prepared! I know because I have made that mistake. Here are some tips to help you enjoy your whale watching. Chances are if you are reading this, you are getting pretty close to visiting Gold Coast. However, if you still planning your holiday Click Here for my planning cheat sheets, tips & tools to step you through the process and make sure you don't miss anything! Gold Coast Whale Watching Season is CLOSED FOR 2018! 2018 Whale Watching season is now CLOSED on Gold Coast. We expect whale watching tours start up again for the 2019 Whale Watching Season from late May 2019 and run through to early November 2019. Check out the booking options for Whale Watching including pre-season deals as they become available, often with huge savings. As I mentioned earlier, it is easy to be unprepared or under-prepared for a whale watching trip. I know from personal experience! I always review experiences, so I can not make the same mistake twice! I hope you find some or all of these useful. I've whale watched from land and I've whale watched on a boat. Each type of whale watching is different, and I made mistakes with both! It won't matter which part of the season you are enjoying, these tips will help you out! The biggest of my whale watching tips? If you haven't already checked out my whale watching tour review, what will I see section, photos and videos, I highly recommend you do. You will probably spot some of my mistakes which led to the creation of these tips! 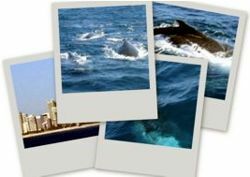 Here goes... my top whale watching tips! These whale watching tips relate mostly to water based whale watching. They are in chronological order roughly! Click on the links to get more information. Make sure you book with a reputable tour operator and you know what you have booked. Be prepared for seasickness even if you haven't had it before. Charge up your camera batteries, empty your memory stick, pack your lens and attach the strap. Don't just take stills - try some video. This one is the most simple of all my whale watching tips! Tours get busy (or should I say booked out) during peak periods and school holidays. Each boat has a limit. Make sure you pre-book your tour so you won't be disappointed. I recommend you book the tour early in your holiday just in case bad weather or poor whale watching conditions means you need to reschedule. Check out my tour comparison and selection tips - so you can work out which is the best for you. Whale watching, especially watching humpback whales, is totally amazing. I would probably rate this as one of the most important of these whale watching tips. On one visit to Northern NSW my sister booked a whale watching boat tour and turned up expecting a lovely big boat. She was somewhat in shock when she discovered that the vessel was a 12 person inflatable in the middle of winter. She's quite intrepid my sister, so it didn't put her off, but she wasn't prepared for it. She was cold to the core and quite wet from the spray. And as great as it was to see the whales right at eye level, she missed out on seeing them from above. You'll notice my photos are mostly from above because I found that so fascinating. Click here for more information about the Gold Coast Whale Watching Tour Operators. Some people don't do water well! I love the water, but I do succumb to some seasickness. To prepare for a trip I do a couple of things. I make sure I don't eat too much before I go and especially nothing greasy. I also take ginger tablets. I avoid tea and coffee before my trip, so I don't have to go to the toilet. If you are feeling rough on a boat, that is the last place you want to go. During the trip I find that salty foods help settle my stomach - may just be a quirk of mine! I also make sure I am out in the fresh air. Seasickness affects people in different ways, some people just seem to not cope with the roughness whilst the boat is moving. I get it when the boat is floating around! When you are whale watching they cut the engines and the boat floats around for perhaps an hour or so. The boat will sometimes be broadside to the waves and so that sideways movement can cause sickness. All I am suggesting is, don't be a hero, be prepared. Ginger tablets are one way, there are others. Find what works for you. And don't be too proud to take a white bag if offered one by the crew. They know the signs! When you select your whale watching trip, I would personally choose a catamaran over a monohull to help reduce the chances of feeling nauseous on a boat. Also, boats with a lower centre of gravity tend not to sway so much, so in this case sometimes biggest isn't best! Most whale watching from the Gold Coast is around 3 to 12 miles offshore. It might be sunny and warm out of the wind in your hotel, but when you are on the ocean it can be totally different. This is particularly true of the winter months (June, July and August), but it will be cooler on the water even in the warmer spring months. So apart from the sunscreen, sunblock, hat and the usual requirements for Australian sun you will also need to make sure you are prepared for wind chill. Even though it was a very sunny day, I was totally freezing on my trip - I must admit I got lost in watching the whales, but I was chilled to the bone. Must have lived in the Gold Coast too long! I swear by my cagoole (waterproof lightweight jacket - that also keeps out the wind) - it is a must pack item wherever I go! Charge up your camera batteries, empty your memory stick, pack your lens and attach the strap. Bring any special lens you might have. And please, please, please attach a strap! You are on a boat! It's moving! Lose your balance and it's you overboard or the camera? Let me see which will I choose? This isn't good in so many ways. An insurance claim! The inconvenience. But mostly, your lost photos and the photos you could have taken! Another great accessory to remember is a filter to protect your lens. I highly recommend this, as I got caught out with this one. When the boat is moving into position for whale watching if you are outside, you may get some spray. If you try to take photos, your camera will get it right on the lens. If you have a filter it is easier to clean off the spray and it doesn't damage your lens. Now before you camera pros start complaining about me even suggesting you let your camera get sprayed - I'm thinking about what I do. This is a trip of a lifetime and I'm not a professional photographer! I want the picture - the camera can be replaced! The other time when your camera may get sprayed is when you capture a lovely close up whale spout! The very fine spray has an uncanny way of finding its way right on to your camera lens, up your nostrils and hanging on to your clothes. As the tour guides call it Whale snot! It's kind of fishy! Right! Camera at the ready and protected! I discovered a feature on my camera after my trip that would have enabled me to take far better action photos! So I am suggesting you get familiar with the lesser used options on your camera like burst options for example. My camera is a digital point and press. All of the photos on this website have been taken with my current camera. It can produce some pretty good shots! On it's standard settings my camera was taking too long to take the shot. I ended up with about 50 shots of ocean water and no whale. The whale had popped up, done its thing and gone back below the water and then my camera took the photo! It was incredibly frustrating. I changed the settings and managed to start getting some shots. Had I mastered the burst and multi-burst function, I'd have had some even more incredible photos. Like most modern gadgets these days, cameras, even simple ones, have many more features than most of us use most of the time. But there are some features there that would enable you to take great action photos. In fact if you know what you are doing you can take totally awesome photographs that you can be proud of. Another area I was wasn't prepared for or even thinking about was using the video function on my camera. If you want a great laugh, check out my video. Laugh at my composition and complete uselessness as camera operator. But also realise stills are great, but video can help to really crystallise the memory and capture some of the atmosphere and magic of the whole experience. Don't Just Take Video - Take Some Stills Too! This one's not for me. I'm the one above. But I saw many people who only took video. I think that is a shame, because your whole memory comes from what you viewed through the video viewer which was running the whole time. I know that you can get stills from your videos now, but the quality is still not quite as good as a photograph. Taking a still requires you to set yourself up, to anticipate and to look around for the opportunities. Now, this makes me laugh. I am such a technophobe that I have only just got a phone with a camera on it. I must be the last person on the planet. I wouldn't even think to take a photo with my phone, let alone a video. However, my husband Andrew, had me in stitches. He was so intent on taking photos with his phone that he nearly lost it over the edge of the boat a few times! It doesn't have a strap like a camera! Here's the tip! If you are using your phone for photos, be really careful! This is by far the most important of all my whale watching tips! Enjoy this experience. It is truly an experience of a lifetime. If you prepare well, you will have good memories of your whale watching trip. With careful preparation you can enjoy your photos or videos. They will help jog the memories so you can relive the moments. I think the whale watching tours have missed a huge opportunity. Smell is such a strong memory anchor. They need to create a perfume called Whale Snot! and sell that as you leave. You can spray it on and instantly whisk yourself back to your whale watching trip. I hope you have enjoyed my whale watching tips. If you have any more I'd love to hear them and with your permission I can even add them to this list! Please come back often, share this with your friends, Like us on Facebook, or Tweet this page using the buttons at the bottom of this page. Haven't selected your whale watching trip yet? Check out our suggestions including some help in selecting the right one for you. Or, the whales & other attractions page for some awesome suggestions for itineraries at this time of the year with lots of savings to be made.